2018 marks the 7th year we have taken part in the National Signing Day Event hosted by ESPN 96.1FM at Celebration Cinema. This is a unique event to West Michigan and demonstrates the support and acknowledgement within the high school football community. Athletes, parents, coaches, and community sponsors all gather to send another class of student-athletes off to college. A huge shoutout goes to the event organizers- Bret Bakita and Jason Hutton, ESPN 96.1fFM, and event originator, legendary Lowell football coach Noel Dean. We are truly spoiled here in West Michigan with our local media that provides one-of-a-kind coverage of our local West Michigan sports! We at PSTS have tremendous pride in West Michigan and want our athletes to succeed as much as possible. Whether it’s through preparation in the weight room, the classroom, or socially – we take on the responsibility of passing down advice from those who have “been there and done that.” With hundreds of college athletes we’ve worked with over the past few years, our goal is to always take what we have learned and share it with our college freshmen-to-be. We provide materials to all those at the Signing Day Event, as well as in-house to our PSTS Premier Football athletes. There currently are 17 PSTS athletes who will make the transition from high school to college football next year. 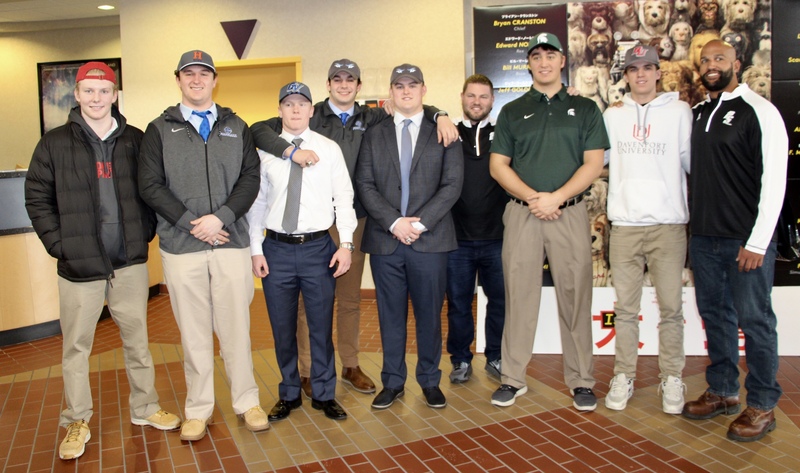 Many of these athletes have spent years training at PSTS and their hard work and dedication paid off with an opportunity to play at the next level. They have set excellent examples to younger athletes in West Michigan who want to pursue their dream of college ball! Great job men, we are very proud of you! *Stay tuned for a list of all our soccer, basketball, softball, and volleyball players going on to play college sports! A handful of the 2018 Signing Day Class! 4 of these guys have trained since middle school, the other 3 are all on their third year with us! Are you an athlete interested in learning more about how these athletes prepare? Contact us HERE to try it yourself!